"We are speaking about an emotional topic. It's not just anatomy. It's not just physiology. It is a representation of womanhood, and surgical menopause is not a simple thing to undergo. For many women, it is traumatizing and it leaves more than just little permanent scars from the laparoscope. For many women with surgical menopause, there is hair loss, bone decay, cardiac disease, depression, hot flashes, insomnia, weight gain, and a myriad of other symptoms. We can't change the fact that you have had your ovaries removed. No one can change the past, and we can't contemplate the 'what if's' for too long or else it is counterproductive. Don't beat yourself up if circumstances are beyond your control and even if mistakes were made. For our own good, we have to move forward, persevere, and gain something today and tomorrow. So what is a woman to do? Well, you can start by leaving a comment. Let's take it one step at a time and see where it leads us. We are women. We are together." To listen to Dr. Aranda discuss these important issues on Life Radio with Deirdre Gilbert, click on the link link below. 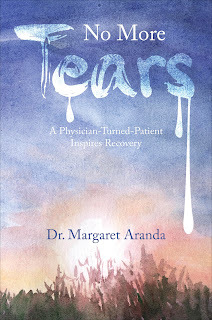 Don't miss Dr. Aranda's latest book 'No More Tears: A Physician Turned Patient Inspires Recovery'. Dr. Aranda's book 'No More Tears: A Physician Turned Patient Inspires Recovery' is available for purchase through her blog site (link posted above) and will be available through your local bookstore after Arpril 19, 2013! There was a day that Margaret Aranda's life got stumped. First she was a Stanford doctor, then she became a trauma patient due to a car accident. Now, she could not stand up or else she would faint. The doctor-turned-patient had an invisible disease and the doctors were stumped too. She was unable to walk and unable to talk, and for over three years, lived on IV fluid. In No More Tears, Dr. Margaret Aranda takes you on a ride to the door of Heaven as she describes her near-death experience after a car accident. No More Tears will inspire you to persevere, to speak up, to be that rare bird, that underdog who wins despite the odds. Her story will remind you that there's always hope! I believe this is a particularly important message for women who've undergone hysterectomy. Dr. Aranda is committed to making a difference for women by speaking out about issues such as informed consent and the consequences of hysterectomy and ovary removal. As Dr, Aranda says "It's About Time"